In a previous article, we looked at the first generation of Panzerjagers. These vehicles greatly aided the Germans during the early part of the war, giving them something with which to counter the growing number of T-34 and KV-1 tanks. Yet by early 1943, it was clear to the Germans that the previous generation of Panzerjagers had many flaws. Among those flaws was a limited traverse main gun and thin armor that only covered the front and sides of the vehicle. At the same time, the Germans had noticed the success of the up-gunned Sturmgeschütz III assault guns when used against tanks. So the Germans decided to design a new set of conversions to be built along the same lines as the Sturmgeschütz assault guns. These new vehicles would be known as Jagdpanzers or hunting tanks. Germany's small but lethal Hetzer hunting tank. The Jagdpanzer 38(t), better known as the Hetzer, was one of the best Jagdpanzers built during the war. Work on the Hetzer went back to 1943 when the Germans were dealing with the flaws of the current Panzerjagers. So the Germans decided to design a replacement for the Marder III to be built along the same lines as the Sturmgeschütz assault guns. The resulting design was a low slung superstructure built on top of a modified Panzer 38(t) chassis. The Hetzer mounted an L/48 75mm gun in a limited traverse "Saukopf" pig's head mantlet. Unlike most other German guns, the 75mm gun on the Hetzer did not have a muzzle brake. The Panzerjager troops liked the Hetzer as it was a small target, not much taller than a standing man. In addition to the low silhouette, it was also highly mobile; those two factors made it a very difficult target for its opponents to kill. The main problem with the Hetzer was that it was very cramped, being only 7 feet high and having a gun the needed to be loaded from the right, mounted on the right side. The Hetzer was such a good design that it remained in production after the war ended and equipped several post-war European armies. Among them was the Swiss army who continued using them until the 1970s when they were finally taken out of service and sold to collectors. A total of 2500 were produced during the war and were issued to the Panzerjager battalions of infantry divisions. You can find the Hetzer in Elsenborn Ridge. By 1943, the Germans felt that the Sturmgeschütz assault guns needed to be up-gunned if they were to keep pace with newer Soviet tank designs. It was decided to fit the new L/70 75mm gun, but the Sturmgeschütz III would need major modifications to fit this larger gun. So the Germans decided to design a fixed superstructure version of the Panzer IV as a fail-safe model. The Panzer IV could fit a larger superstructure that would be more likely to mount the larger L/70 gun. The final design, known as the Jagdpanzer IV, was a well-sloped, thickly armored superstructure built on top of a Panzer IV hull. This superstructure was very hard to penetrate as many times American and British tank crews fired their 75mm guns at close range and watched their shells bounce right off. The first models mounted the L/48 75mm gun, the same gun that armed the Panzer IV on which the conversion was based. This defeated the entire purpose of the conversion, as the goal was to mount the larger and more powerful L/70 gun. The reason for this was that the L/70 gun was needed to arm the higher-priority Panther tanks, so the first models had to be content with the shorter guns. Despite the failure to mount the longer gun, the Jagdpanzer IV was still very effective with its low silhouette and thick, well-sloped armor. Many in the Panzerjager force felt that the Jagdpanzer IV was good enough in its current form, but Hitler felt otherwise and ordered that a new model with the L/70 gun be produced immediately. So a new model appeared in mid-1944, not many of this model were produced as the change over was taking a long time; too long for Hitler. In late 1944, Hitler again ordered that the changeover to the L/70 model be made at all costs, so a new model came out with a crude superstructure mounting an L/70 gun. Few of this crude model were built because German industry was in smoking ruins at the hands of the Allied air forces by this point. While the new L/70 models had a better gun, they had reduced mobility as the longer gun overloaded the front of the vehicles. This forced the designers to the rim the front road wheels with steel instead of rubber, thus reducing off-road mobility. A total of 1,700 Jagdpanzer IVs were produced between January 1944 and March 1945 with the first vehicles being sent to the 12th SS "Hitler Jugend" and Hermann Goering divisions. The Jagdpanzer IV appears in Elsenborn Ridge mounting the L/70 gun. The widely feared Hunting Panther. Many regard the Jagdpanther as the best Jagdpanzer ever built, as it possessed the perfect balance of armor, firepower and mobility. The Jagdpanther was designed in mid 1943, at which time it had become an unofficial German policy that when a new tank was designed a fixed superstructure version was to be produced mounting a bigger gun. A mock-up of the Jagdpanther, then known as the Panzerjager Panther, was shown to Hitler in October of 1943. Shortly afterwards the Panzerjager Panther entered production, but before it did Hitler ordered the name changed to Jagdpanther for propaganda reasons. Like all other Jagdpanzers, the conversion involved removing the turret and upper hull and replacing them with a thick well-sloped armored superstructure. In this superstructure was mounted a massive L/71 88mm gun. This was an extremely powerful weapon capable of killing most Allied tanks at ranges of over 2000m. The Jagdpanther was a weapon feared by Allied tank commanders, especially in Normandy, where many times a single Jagdpanther could hold up entire Allied armored advances for hours until they could be found and then destroyed by air support. It was also feared by Russian tankers on the Eastern Front, where its long-range gun proved very effective. The only problem was that there just were not enough Jagdpanthers. Plans called for production of some 300 Jagdpanthers a month, but because of Allied bombing raids, German industry only produced some 350 during the entire war. 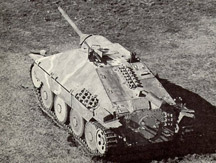 What Jagdpanthers were produced were sent to independent heavy tank destroyer battalions, not to individual Panzer divisions like most other Jagdpanzers. These battalions would be attached to units in key sectors of the line in a similar manner as the Tiger and King Tiger heavy tank battalions. So far the Jagdpanther appears in Road to Berlin and Elsenborn Ridge. It's not usually safe to taunt a Hunting Tiger. Like the Panther and most other German tanks before it, the King Tiger tank had a fixed superstructure version produced. A mock-up of the Jagdtiger was shown to Hitler in the fall of 1943 and with his obsession with big tanks he ordered plans for production to go ahead. The Jagdtiger had a huge heavily-armored superstructure that was up to 250mm thick on the front of the tank. It was armed with the massive 128mm gun, which was the largest gun mounted on any tank during the war. This gun's shells were so large that separate-loading ammunition had to be used, and this lowered the rate of fire despite having two loaders instead of the usual one. Despite sporting the most powerful tank gun of World War II, it had a huge number of flaws. First of all, the suspension on the very first models could not take the nearly 80-ton weight of the huge tank. This problem was later fixed by an improved suspension, but even then it only had a maximum cross-country speed of 9 miles per hour. It was also very unreliable due to the massive weight and broke down often. Because of its slow speed and unreliability it was often reduced to a mobile strong point. Production of the Jagdtiger began early in the summer of 1944 and around 70 were produced up to the end of the war. Only a few saw combat as many of those produced did not even reach front-line units. At one point, 88mm guns were used instead of the 128mm gun due to shortages of the new gun. Like the other heavy Panzerjagers and Jagdpanzers, Jagdtigers were sent to heavy tank destroyer battalions. The Jagdtiger can be seen in Spearhead Division..
Click here to order Elsenborn Ridge right now!